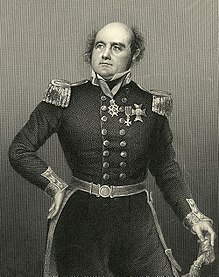 Sir John Franklin KCH FRGS (16 April 1786 – 11 June 1847) was a British Royal Navy officer and explorer of the Arctic. Franklin also served as Lieutenant-Governor of Van Diemen's Land from 1837 to 1843. He disappeared while on his last expedition, attempting to chart and navigate the Northwest Passage in the North American Arctic. The icebound ships were abandoned and the entire crew died of starvation, hypothermia, tuberculosis, lead poisoning, and scurvy. Franklin was born in Spilsby, Lincolnshire, on 16 April 1786, the ninth of twelve children born to Hannah Weekes and Willingham Franklin. His father was a merchant descended from a line of country gentlemen while his mother was the daughter of a farmer. One of his brothers later entered the legal profession and eventually became a judge in Madras; another joined the East India Company; while a sister, Sarah, was the mother of Emily Tennyson, wife of Alfred, Lord Tennyson. Educated at King Edward VI Grammar School in Louth, he soon became interested in a career at sea. His father, who intended for Franklin to enter the church or become a businessman, was initially opposed but was reluctantly convinced to allow him to go on a trial voyage on a merchant ship when he was aged 12. His experience of seafaring only confirmed his interest in a career at sea, so in March 1800, Franklin's father secured him a Royal Navy appointment on HMS Polyphemus. Commanded by a Captain Lawford, the Polyphemus carried 64 guns and, at the time of Franklin's appointment, was still at sea. He did not join the vessel until the autumn of 1800. Initially serving as a first class volunteer, Franklin soon saw action in the Battle of Copenhagen in which the Polyphemus participated as part of Horatio Nelson's squadron. An expedition to the coast of Australia aboard HMS Investigator, commanded by Captain Matthew Flinders, followed, with Franklin now a midshipman. He was present at the Battle of Trafalgar in 1805 aboard HMS Bellerophon, and at the Battle of New Orleans. He accompanied Captain Nathaniel Dance on the Earl Camden, frightening off Admiral Charles de Durand-Linois at the Battle of Pulo Aura in the South China Sea on 14 February 1804. In 1819, Franklin was chosen to lead an expedition overland from Hudson Bay to chart the north coast of Canada eastwards from the mouth of the Coppermine River. On his 1819 expedition, Franklin fell into the Hayes River at Robinson Falls and was rescued by a member of his expedition about 90 metres (98 yd) downstream. Between 1819 and 1822, he lost 11 of the 20 men in his party. Most died of starvation, but there were also at least one murder and suggestions of cannibalism. The survivors were forced to eat lichen and even attempted to eat their own leather boots. This gained Franklin the nickname of "the man who ate his boots". In 1823, after returning to England, Franklin married the poet Eleanor Anne Porden. Their daughter, Eleanor Isabella, was born the following year. His wife died of tuberculosis in 1825. In 1825, he left for his second Canadian and third Arctic expedition. The goal this time was the mouth of the Mackenzie River from which he would follow the coast westward and possibly meet Frederick William Beechey who would try to sail northeast from the Bering Strait. With him was John Richardson who would follow the coast east from the Mackenzie to the mouth of the Coppermine River. At the same time, William Edward Parry would try to sail west from the Atlantic. (Beechey reached Point Barrow and Parry became frozen in 900 miles east. At this time, the only known points on the north coast were a hundred or so miles east from the Bering Strait, the mouth of the Mackenzie, Franklin's stretch east of the Coppermine, and a bit of the Gulf of Boothia which had been seen briefly from land.) Supplies were better organized this time, in part because they were managed by Peter Warren Dease of the Hudson's Bay Company. After reaching the Great Slave Lake using the standard HBC route, Franklin took a reconnaissance trip 1,000 miles down the Mackenzie and on 16 August 1825, became the second European to reach its mouth. He erected a flagpole with buried letters for Parry. He returned to winter at Fort Franklin on the Great Bear Lake. The following summer he went downriver and found the ocean frozen. He worked his way west for several hundred miles and gave up on 16 August 1826 at Return Reef when he was about 150 miles east of Beechey's Point Barrow. Reaching safety at Fort Franklin on 21 September, he left Fort Franklin on 20 February 1827 and spent the rest of the winter and spring at Fort Chipewyan. He reached Liverpool on the first of September 1827. Richardson's eastward journey was more successful. On 5 November 1828, he married Jane Griffin, a friend of his first wife and a seasoned traveller who proved indomitable in the course of their life together. On 29 April 1829, he was knighted by George IV and the same year awarded the first Gold Medal of the Société de Géographie of France. On 25 January 1836, he was made Knight Commander of the Royal Guelphic Order and a Knight of the Greek Order of the Redeemer. His wife worked to set up a university, which was eventually established in 1890, and a museum, credited to the Royal Society of Tasmania in 1843 under the leadership of her husband. Lady Franklin may have worked to have the Lieutenant-Governor's private botanical gardens, established in 1818, managed as a public resource. Lady Franklin also established a glyptotheque and surrounding lands to support it near Hobart; it was her intent to civilise the colony. The village of Franklin, on the Huon River, is named in his honour, as is the Franklin River on the West Coast of Tasmania, one of the better known Tasmanian rivers due to the Franklin Dam controversy. Shortly after leaving his post as Governor of Tasmania Franklin revisited a cairn on Arthur's Seat, a small mountain just inside Port Phillip Bay, that he had visited as a midshipman with Captain Matthew Flinders in April 1802. On this trip he was accompanied by Captain Reid of The Briars and Andrew Murison McCrae of Arthurs Seat Station, now known as McCrae Homestead. Exploration of the Arctic coastal mainland after Franklin's second Arctic expedition had left less than 500 kilometres (311 mi) of unexplored Arctic coastline. The British decided to send a well-equipped Arctic expedition to complete the charting of the Northwest Passage. 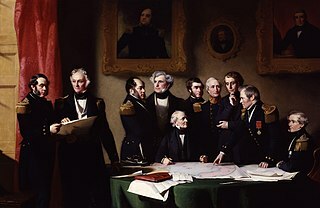 After Sir James Clark Ross declined an offer to command the expedition, an invitation was extended to Franklin, who accepted despite being 59 years old. A younger man, Captain James Fitzjames, was given command of HMS Erebus and Franklin was named the expedition commander. 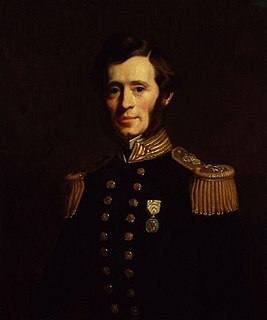 Captain Francis Crozier, who had commanded HMS Terror during the Ross Antarctic expedition of 1841–1844, was appointed executive officer and commander of Terror. Franklin was given command on 7 February 1845, and received official instructions on 5 May 1845. The Erebus and Terror were sturdily built and were outfitted with recent inventions. These included steam engines from the London and Greenwich Railway that enabled the ships to make 4 knots (7.4 km/h) on their own power, a unique combined steam-based heating and distillation system for the comfort of the crew and to provide large quantities of fresh water for the engine's boilers, a mechanism that enabled the iron rudder and propeller to be drawn into iron wells to protect them from damage, ships' libraries of more than 1,000 books, and three years' worth of conventionally preserved or tinned preserved food supplies. Unfortunately, the latter was supplied from a cut-rate provisioner who was awarded the contract a few months before the ships were to sail. Though the provisioner's "patent process" was sound, the haste with which he had prepared thousands of cans of food led to sloppily-applied beads of solder on the cans' interior edges, allowing lead to leach into the food. Additionally, the water distillation system may have used lead piping and lead-soldered joints, which would have produced drinking water with a high lead content. Chosen by the Admiralty, most of the crew were Englishmen, many from northern England, with a small number of Irishmen and Scotsmen. The Franklin Expedition set sail from Greenhithe, England, on 19 May 1845, with a crew of 24 officers and 110 men. The ships travelled north to Aberdeen and the Orkney Isles for supplies. From Scotland, the ships sailed to Greenland with HMS Rattler and a transport ship, Barretto Junior. After misjudging the location of Whitefish Bay on Disko Island, the expedition backtracked and finally harboured in that far north outpost to prepare for the rest of their voyage. Five crew members were discharged and sent home on the Rattler and Barretto Junior, reducing the ships' final crew size to 129. The expedition was last seen by Europeans on 26 July 1845, when Captain Dannett of the whaler Prince of Wales encountered Terror and Erebus moored to an iceberg in Lancaster Sound. It is now believed that the expedition wintered on Beechey Island in 1845–1846. 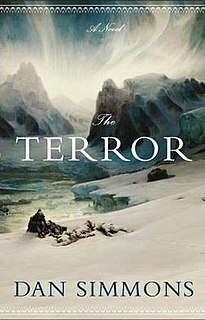 Terror and Erebus became trapped in ice off King William Island in September 1846 and never sailed again. According to a note later found on that island, Franklin died there on 11 June 1847. To date, the exact location of his grave is unknown. After two years and no word from the expedition, Lady Franklin urged the Admiralty to send a search party. Because the crew carried supplies for three years, the Admiralty waited another year before launching a search and offering a £20,000 reward for finding the expedition. The money and Franklin's fame led to many searches. At one point, ten British and two American ships, USS Advance and USS Rescue, headed for the Arctic. Eventually, more ships and men were lost looking for Franklin than in the expedition itself. Ballads such as "Lady Franklin's Lament", commemorating Lady Franklin's search for her lost husband, became popular. In the summer of 1850, expeditions, including three from England as well as one from the United States, joined in the search. 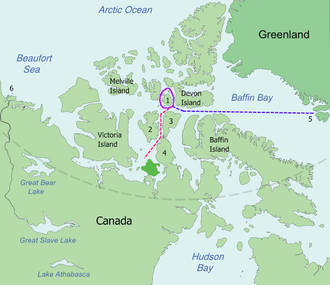 They converged off the east coast of Beechey Island, where the first relics of the Franklin expedition were found, including the gravesites of three Franklin Expedition crewmen. Many presumed Franklin was still alive, and he was promoted to Rear-Admiral of the Blue in October 1852, an example of an unintentional posthumous promotion. In 1854, the Scottish explorer John Rae, while surveying the Boothia Peninsula for the Hudson's Bay Company, discovered the true fate of the Franklin party from talking to Inuit hunters. He was told both ships had become icebound, and the men had tried to reach safety on foot but had succumbed to cold, and some had resorted to cannibalism. Rae's report to the Admiralty was leaked to the press, which led to widespread revulsion in Victorian society, enraged Franklin's widow, and condemned Rae to ignominy. Lady Franklin's efforts to eulogise her husband, with support from the British Establishment, led to a further 25 searches over the next four decades, none of which would add much further information of note regarding Franklin and his men, but contributed hugely to the mapping of the Arctic. In the mid-1980s, Owen Beattie, a University of Alberta professor of anthropology, began a 10-year series of scientific studies that showed that the Beechey Island crew had most likely died of pneumonia and perhaps tuberculosis. Toxicological reports indicated that lead poisoning was also a possible factor. In 1997, more than 140 years after his report, Dr. Rae's account was finally vindicated; blade-cut marks on the bones of some of the crew found on King William Island strongly suggested that conditions had become so dire that some crew members resorted to cannibalism. Evidence suggestive of breakage and boiling of bones, characteristic of efforts to extract marrow, was subsequently identified. It appeared from these studies that a combination of bad weather, years locked in ice, poisoned food, botulism, starvation, and disease including scurvy, had killed everyone in the Franklin party. In October 2009, marine archaeologist Robert Grenier outlined recent discoveries of sheet metal and copper which have been recovered from 19th-century Inuit hunting sites. Grenier firmly believes these pieces of metal once belonged to the Terror and formed the protective plating of the ship's hull. After studying 19th-century Inuit oral testimony – which included eyewitness descriptions of starving, exhausted men staggering through the snow without condescending to ask local people how they survived in such a wilderness – [Grenier] believes the 19th-century official accounts that all the surviving expedition members abandoned their ice-locked ships are wrong. He believes both ships drifted southwards, with at least two crew remaining until the final destruction of their vessels. One broke up, but Inuit hunters arriving at their summer hunting grounds reported discovering another ship floating in fresh ice in a cove. The ship, probably the Terror, was very neat and orderly, but the Inuit descended into the darkness of the hull with their seal-oil lamps, where they found a tall dead man in an inner cabin. Grenier believes it was there they recovered the copper, which was more valuable than gold to them, and tools including shears from the ship's workshop with which to work it. Hauntingly, they also reported that one of the masts was on fire. Grenier wonders if what they saw was the funnel from the galley still smoking from a meal cooked that morning, before the last of Franklin's men disappeared from history. For years after the loss of the Franklin party, the Victorian era media portrayed Franklin as a hero who led his men in the quest for the Northwest Passage. A statue of Franklin in his home town bears the inscription: "Discoverer of the North West Passage". Statues of Franklin outside the Athenaeum Club in London and in Tasmania bear similar inscriptions. Franklin has become the namesake of many geographic locales, among them Franklin Island in Antarctica, Franklin Island in Greenland, Franklin Sound north of Tasmania, Franklin Strait in northern Canada, and the Franklin River in Tasmania, as well as many streets and schools. The Australian oceanographic research vessel RV Franklin bears his name as well. The wintering site of Franklin's second Canadian expedition, in Deline, Northwest Territories, was designated a National Historic Site of Canada in 1996. The explorer was also remembered when one of Canada's Northwest Territories subdivisions was named the District of Franklin. In 2009, a special service of Thanksgiving was held in the chapel at the Royal Naval College to accompany the rededication of the national monument to Sir John Franklin. It was a celebration of the contributions made by the United Kingdom in the charting of the Canadian North, and honoured the loss of life in the pursuit of geographical discovery. It also marked the 150th anniversary of Francis McClintock's voyage aboard the yacht Fox, returning to London with news of the tragedy. In September 2014, the wreck of HMS Erebus was rediscovered, and in September 2016 the wreck of HMS Terror was discovered, south of King William Island in Terror Bay and in "pristine" condition. This is many miles south of the last known location of the Terror. Archaeologists believe the Terror must have been crewed and sailed to its new location, as the anchor was used and it has sailed through a maze of islands and channels. The wrecks are designated as National Historic Sites of Canada, with the precise location of the designation in abeyance. "Franklin Saga Deaths: A Mystery Solved?". National Geographic Magazine. Vol. 178 no. 3. September 1990. Beardsley, Martyn. Deadly Wintre: The Life of Sir John Franklin. Beattie, Owen, and Geiger, John (1989). Frozen in Time: Unlocking the Secrets of the Franklin Expedition. Saskatoon: Western Producer Prairie Books. ISBN 088833303X. Beattie, Owen and Geiger, John (2004). Frozen In Time: The Fate of the Franklin Expedition (Revised edition). Cookman, Scott (2001). Ice Blink: The Tragic Fate of Sir John Franklin's Lost Polar Expedition ISBN 0471404209. Hutchinson, Gillian (2009). "Searching for Franklin and the Northwest Passage" ISBN 9780948065842. Davis, Richard C. (1995). "Sir John Franklin's Journals and Correspondence: The First Arctic Land Expedition, 1819–1822". The Champlain Society. ISBN 0969342543. Davis, Richard C. (1998). "Sir John Franklin's Journals and Correspondence: The Second Arctic Land Expedition, 1825–1827". The Champlain Society. ISBN 0969342594. Joel, C. R. (2011). A Tale of Ambition and Unrealised Hope: John Montagu and Sir John Franklin. ISBN 9781921509827. Owen Beatle and John Geiger (1992). "Buried in ice: The mystery of a lost arctic expedition" ISBN 0590438492. Lambert, Andrew (2009). Franklin: Tragic Hero of Polar Navigation. ISBN 9780571231607. McGoogan, Ken Fatal Passage and Lady Franklin's Revenge. Mirsky, Jeannette (1970). To the Arctic! : The Story of Northern Exploration from Earliest Times. ISBN 0226531791. Murray, David. (2004). The Arctic Fox: Francis Leopold McClintock, Discoverer of the fate of Franklin. Cork: The Collins Press, ISBN 1550025236. Payton, Brian (2009). The Ice Passage ISBN 9780385665322. Potter, Russell A. (2016). Finding Franklin: The Untold Story of a 165-Year Search. Montreal: McGill-Queen's University Press ISBN 0773547843. Poulsom, Neville W. & Myres, J. A. L. (2000). British polar exploration and research : a historical and medallic record with biographies, 1818–1999. London: Savannah. Franklin's bones are mentioned in John Spearn's "The Crimson Maple Leaf"
^ a b Lamb 1956, p. 13. ^ Traill 1896, p. 3. ^ Lamb 1956, p. 14. ^ Lamb 1956, p. 15. ^ Lamb 1956, pp. 15–16. ^ Lamb 1956, p. 16. ^ Traill 1896, p. 8. ^ Lamb 1956, p. 17. ^ Lamb 1956, p. 18. ^ Holland, Clive (1988). "Franklin, Sir John". In Halpenny, Francess G (ed.). Dictionary of Canadian Biography. VII (1836–1850) (online ed.). University of Toronto Press. ^ "Great Canadian Rivers: The Hayes". TV Ontario. Great Canadian Rivers. 29 October 2001. Retrieved 14 December 2013. ^ Franklin, John (3 August 2006). Narrative of a Journey to the Shores of the Polar Sea. II (3rd ed.). London: John Murray. p. 279 – via Gutenberg.org. ^ "Address". The Hobart Town Courier (Tas: 1827–1839). 26 May 1837. p. 3 – via NLA Australian Newspapers. ^ Serle, Percival (1949). "Franklin, John (1786–1847)". Dictionary of Australian Biography. Angus and Robertson – via Project Gutenberg Australia. ^ Kathleen, Fitzpatrick (1966). "Franklin, Sir John (1786–1847)". Australian Dictionary of Biography. 1. Canberra: Australian National University. ^ McLear, Colin (2006). A Dreamtime of Dromana: A History of Dromana Through the Eyes of a Pioneering Family. Dromana and District Historical Society. p. 22. ISBN 978-0-9757127-6-4. ^ Gibson, William (1937). "Sir John Franklin's Last Voyage: A brief history of the Franklin expedition and the outline of the researches which established the facts of its tragic outcome". The Beaver: 48. ^ Battersby, William (2008). "Identification of the Probable Source of the Lead Poisoning Observed in Members of the Franklin Expedition" (PDF). Journal of the Hakluyt Society. ^ M'Clintock, Francis L. (1859). The Voyage of the 'Fox' in the Arctic Seas. A Narrative of the Discovery of the Fate of Sir John Franklin and His Companions. London: John Murray. ^ "No. 21375". The London Gazette. 2 November 1852. p. 2867. ^ a b McGoogan, Ken (2002). Fatal Passage: The True Story of John Rae, the Arctic Hero Time Forgot. Toronto: HarperCollins. ISBN 9780006386599. ^ Amy, Roger; Bhatnagar, Rakesh; Damkjar, Eric; Beattie, Owen (15 July 1986). "The last Franklin Expedition: report of a postmortem examination of a crew member". Canadian Medical Association Journal. 135 (2): 115–117. PMC 1491204. PMID 3521821. ^ Notman, Derek N.H.; Anderson, Lawrence; Beattie, Owen B.; Roger, Amy (August 1987). "Arctic Paleoradiology: Portable Radiographic Examination of Two Frozen Sailors from the Franklin Expedition (1845–48)". American Journal of Roentgenology. 149 (2): 347–350. doi:10.2214/ajr.149.2.347. PMID 3300222. ^ Kowall, Walter; Beattie, Owen B.; Baadsgaard, Halfdan (25 January 1990). "Did solder kill Franklin's men?". Nature. 343 (6256): 319–320. Bibcode:1990Natur.343..319K. doi:10.1038/343319b0. ^ Kowall, W.A. ; Krahn, P.M.; Beattie, O.B. (1989). "Lead Levels in Human Tissues from the Franklin Forensic Project". International Journal Environmental Analytical Chemistry. 35 (2): 119–126. doi:10.1080/03067318908028385. ^ Keenleyside, Anne; Bertulli, Margaret; Fricke, Henry C. (March 1997). "The Final Days of the Franklin Expedition: New Skeletal Evidence" (PDF). Arctic. 50 (1): 36–46. doi:10.14430/arctic1089. ^ Kennedy, Dominic (29 July 2015). "Sailors sucked the marrow out of their shipmates". The Times. ^ Mays, S; Beattie, O (4 August 2015). "Evidence for End-stage Cannibalism on Sir John Franklin's Last Expedition to the Arctic, 1845". International Journal of Osteoarchaeology. 26 (5): 778–786. doi:10.1002/oa.2479. ^ Kennedy, Maev (28 October 2009). "Copper clue may solve mystery of doomed Victorian Arctic expedition". The Guardian. ^ Déline Fishery / Franklin's Fort National Historic Site of Canada. Canadian Register of Historic Places. Retrieved 4 October 2013. ^ Déline Fishery / Franklin's Fort National Historic Site of Canada. Directory of Federal Heritage Designations. Parks Canada. ^ Lewis-Jones, Huw. "'Nelsons of Discovery': Notes on the Franklin Monument in Greenwich" (PDF). pp. 77–105. ^ Harper, Kenn (19 November 2009). "Taissumanni, Nov. 20: Re-dedication of the Franklin Monument". Nunatsiaq News. ^ Potter, Russell (6 November 2009). "A Night of Polar Stars". Visions of the North. ^ "Sir John Franklin: Fabled Arctic ship found". BBC Online. 9 September 2014. ^ "Ship found in Arctic 168 years after doomed Northwest Passage attempt". The Guardian. 12 September 2016. ^ Wrecks of HMS Erebus and HMS Terror National Historic Site of Canada. Canadian Register of Historic Places. Retrieved 29 October 2013. ^ Wrecks of HMS Erebus and HMS Terror National Historic Site of Canada. Directory of Federal Heritage Designations. Parks Canada. ^ Macfarlane, Robert (18 December 2003). "Read it on the autobahn". London Review of Books. Retrieved 11 July 2015. ^ Harper, Stephen (17 August 2006). The Call of the North (Speech). Yellowknife, Northwest Territories. Archived from the original on 16 February 2013. 'Ladies and gentlemen, I'd like to end by leaving you with a line from Stan Rogers' unofficial Canadian anthem – Northwest Passage. ^ Gudgeon, Chris; Mcintosh, Andrew (4 March 2015) [August 29, 2013]. "Stan Rogers". The Canadian Encyclopedia (online ed.). Historica Canada. Lamb, G. F. (1956). Franklin: Happy Voyager. London: Ernest Benn. OCLC 250937261. O'Byrne, William Richard (1849). "Franklin, John (a)" . A Naval Biographical Dictionary . John Murray – via Wikisource. Traill, H. D. (1896). The Life of Sir John Franklin, R.N. London: John Murray. OCLC 316480873. Alexander, Alison (editor) (2005)The Companion to Tasmanian History. Centre for Tasmanian Historical Studies, University of Tasmania, Hobart. ISBN 186295223X. Wikimedia Commons has media related to John Franklin.